Michael Kelly Controls His Entire Environment with the Help of the AutonoME ECU, Equipped with Both Sip and Puff and Eyegaze Technology. (Spring Hill, FL) – U.S. Army veteran Michael Kelly proudly served in Vietnam. During his tour, he experienced the conflicts and hostilities of war. However, his true battles were yet to come. Kelly was diagnosed five years ago with Amyotrophic Lateral Sclerosis (ALS), also known as Lou Gehrig’s disease. Because of his military service, Kelly qualifies for assistance from the Veteran’s Administration (VA). 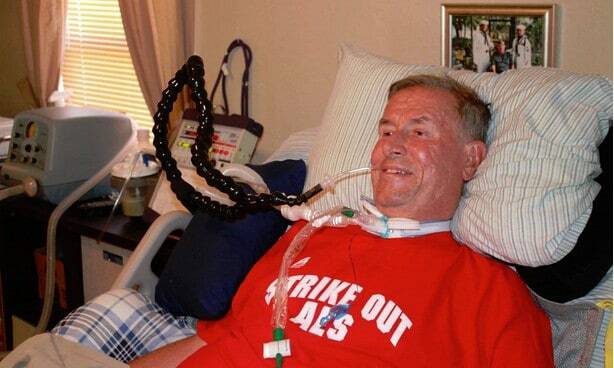 Kelly’s debilitating condition has slowly taken away his independence, so the James A. Haley Veterans’ Hospital in Tampa, Florida purchased an Environmental Control Unit (ECU) for him. The results have been nothing less than inspiring. Accessibility Services, Inc. (ASI) in Homosassa, Florida produces the autonoME ECU. The company customizes the devices to fit the specific needs of each client. In Kelly’s case, the unit was equipped with both Sip and Puff and Eyegaze technology. While in bed, Kelly prefers to operate the autonoME through his sip and puff switch. When on the go, he transfers the autonoME to his wheelchair and controls it via an Eyegaze Camera. Green says success stories like Kelly’s are exactly what inspires ASI to continue researching and developing new ECU options and technologies. Accessibility Services, Inc. (ASI) is a leading provider of environmental control units (ECU’s) designed specifically for individuals with severe disabilities and spinal cord injuries. Founded in 1989 with a primary vision to help veterans, the company has since expanded its mission to address the needs of all severely disabled individuals with a special focus on the unique and exceptional needs of the quadriplegic community. ASI designs, customizes, installs and services ECU’s which enable clients to control their entire surroundings and environment, thus significantly increasing independence and improving quality of life. ASI’s proprietary autonoME unit has become one of the most popular hospital and residential devices on the market. Founder Fred Thompson’s philosophy, “we start with the customer and work backwards” has inspired ASI’s research and development engineers to stay one step ahead of technology, ensuring the company delivers the most advanced and progressive ECU solutions available. For more information, visit https://accessibilityservices.com.